The Maricopa Unified School District’s governing board voted Wednesday to approve the relocation of sixth grade classes from the district’s six elementary schools to its two middle schools. The decision came down as a result of the recent override measure, which will expand elementary school faculties by an average of four teachers per school, reducing the number of available classrooms. 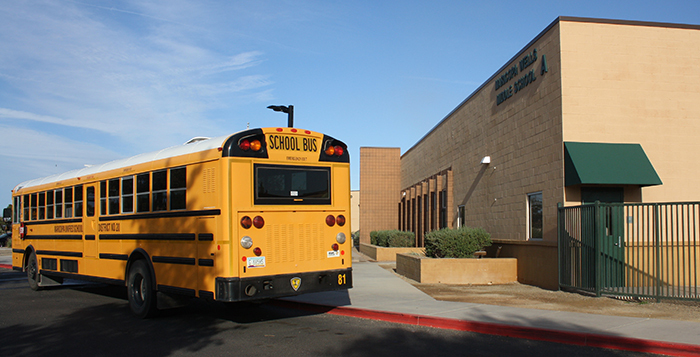 To accommodate this growth the district has decided to move sixth grade classes to Desert Wind and Maricopa Wells middle schools, where Superintendent Steve Chestnut believes the sixth graders belong. Board member Torri Anderson voiced her concern over the possible infringement on special-needs and blended learning programs, which currently use space at Maricopa Wells that sixth grade classes will be occupying in the future. Chestnut acknowledged there will be some issues with relocating those programs, but classroom space is available elsewhere in the district which can be utilized for those smaller programs, he said. No decisions on the relocation of those programs has been finalized. Anderson also inquired about the move effectively reversing a 2013 board decision, which resulted in the relocation of sixth grade to elementary schools. The move was in part designed as a cost-saving effort by the district. However it was also meant to encourage parents to retain their children in MUSD for as long as possible. It’s unclear if the effort did, in fact, have an impact on the retention of students, as Chestnut did not have statistical information to present on the topic. Relocation of the sixth grade classes is set to begin with the 2017-2018 school year.